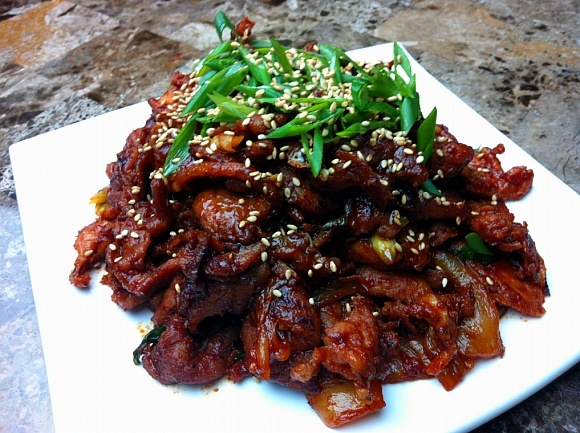 Home Entree	Korean Spicy Pork! Ya’ll want some more spicy food?! If you have left over, make some kimchi fried rice and scrambled eggs and wrap it up in a warm flour tortilla to make burrioto! Combine first 12 ingredients in a food processor and ground until you don't see any chunk of onion or garlic. In a large mixing bowl, add pork and pour marinate sauce. Mix with your hand(I recommend to wear a plastic glove!) until combined and every layer of pork is coated with marinate. Add meat mixture and sliced onion in a large skillet; turn on heat to high-heat. Stir to mix meat and onion. When it starts simmering, keep stirring with a wooden spoon about 20-25 minutes until pork cooked all the way through and moisture has evaporated. Add sliced Serrano peppers if your desired 1 minute before remove spicy pork from heat. Remove from heat and top with chopped green onion. Sprinkle sesame seeds right on top and a little bit of drizzling if sesame oil if you like to! you can find thin cut meat at Asian grocery store or you can cut by yourself. Freeze meat about 1 hour, and cut with your sharp knife. If you prefer use thick chunk meat that is totally fine too. 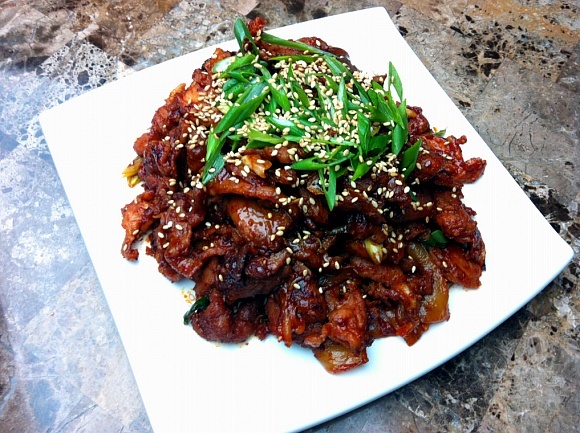 It’s my always to go menu, so easy to prepare and delicious everyone loves it!! This is spicylicious goodness! I love love love your marinade, I might use this for bulgogi. This is must try! Thanks for sharing, oh and I love your videos! I love this and love you! Made this tonight with some brown rice, extremely delicious! So spicy and juicy! Mmmm thanks so much! Love your videos as well! Amazing recipe, Thank you it was so so good !